It’s the buildup that makes watching the cars line up on the grid and complete an installation lap especially excruciating. Nothing can compare to the moment the first start light comes on, except when it is bested seconds later when all five start lights are extinguished and the race begins. This tension was in no short supply in Ad Diriyah last weekend. Formula E had arrived, with the promise of the new fifth season, new teams, and a new generation of cars, all coming together with the promise that something exciting was happening. Dampened, as it was, by hosting the event in a country with well-documented and ongoing human rights abuses, this excitement could not be fully neutralised. Reddit threads debated how best to protest – should viewers torrent the race post-broadcast in an attempt to lower viewer numbers? Formula E’s knack for hosting events in city street circuits dotted with identical concrete and steel catch fencing, and adorned with billboards for season-long sponsors, means that the background for each individual race becomes less apparent (for better or worse). The tension was helped, in no small part, by the hectic nature of a Formula E “weekend”, condensed into a single day to minimise the effect on city commuters and sell a better package to TV broadcasters for the fledgeling motorsport category. Practice, and qualifying, then, occurred hours before the race. 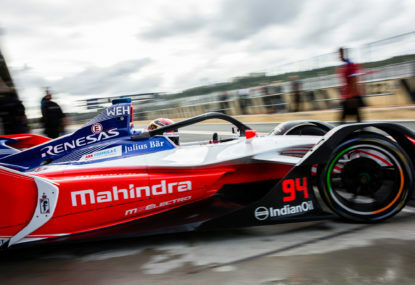 When intense and unexpected rain hit the practice and qualifying sessions, leaving Formula E and FIA officials to change session formats at the last minute, it became unpredictable. Add in the fact these cars had never run in full race trim, and the unpredictable became pure chaos. The race itself showed the early dominance of some and the unpreparedness of others. António Félix Da Costa, driving for BMW, took home the trophy, holding off the surging DS Techeetah pairing of Jean-Éric Vergne and André Lotterer. The gold and black machines tore through the pack, and had captured a 1-2 lead of the race before a software issue meant that both cars exceeded regeneration power limits and were issued with drive-through penalties. Despite their penalties, the pair finished second and fifth respectively, with Vergne less than half-a-second off the lead and Lotterer being awarded a bonus point for fastest lap. Elsewhere, there were some seriously engaging three-way battles, as drivers found surprising amounts of space on the tight 2.495km Ad Diriyah circuit. Highlights included Jose Mario-Lopez versus Sebastian Buemi versus Jerome D’Amrosio going through the tight complex of turns 18-20. The real story of Saturday, and one which will hopefully develop over the duration of Formula E Season 5, is the competition between the teams backed by massive car manufacturers. Carmakers have rushed to the series as they seek to test their electric technology and market their vehicles to a captive audience who need no explaining about the benefits of an electric car. BMW entered this year, as have HWA in preparation for a full Mercedes team in 2019. Nissan, Audi, Jaguar all have entries, as does NIO, a Chinese electric vehicle startup founded in 2014. All of the manufacturer teams seemed to be competitive in some sense on Saturday as mixed results for BMW made it hard to compare their true speed, while the Nissan and Audi cars both finished in pairs. The real standout, however, were the two DS Techeetah cars, who will prove to be the team to watch next time out. Meanwhile, Formula One exports Felipe Massa and Stoffel Vandoorne both had races they’d sooner forget. Vandoorne slipped down to 17th from his 4th-place starting position, while Massa’s successful run and entertaining overtakes were minimised by two penalties which pushed him down to 17th, moving Vandoorne back up to 16th post-race. Formula E reconvenes for the Marrakesh E-Prix on January 12, 2019.